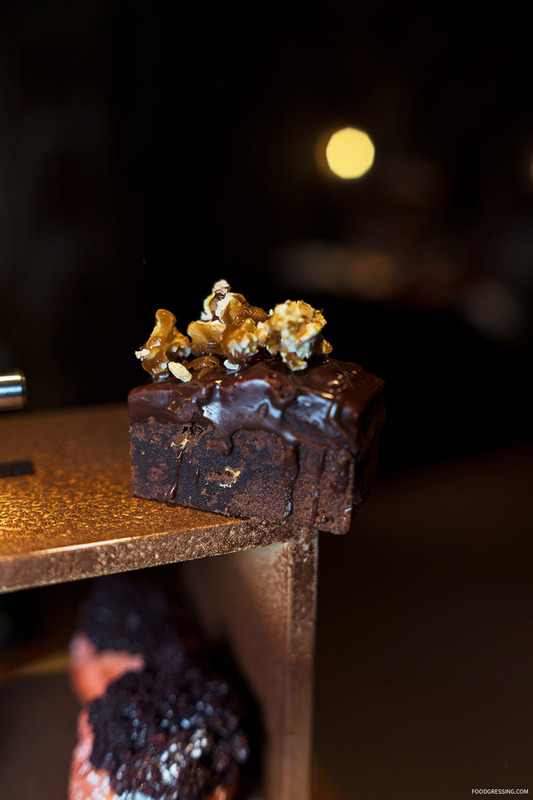 Until the end of April, the Fairmont Hotel Vancouver’s Notch8 Restaurant takes on a “mad scientist” role as they present a pop-up Chocolate Laboratory Dessert Lounge. 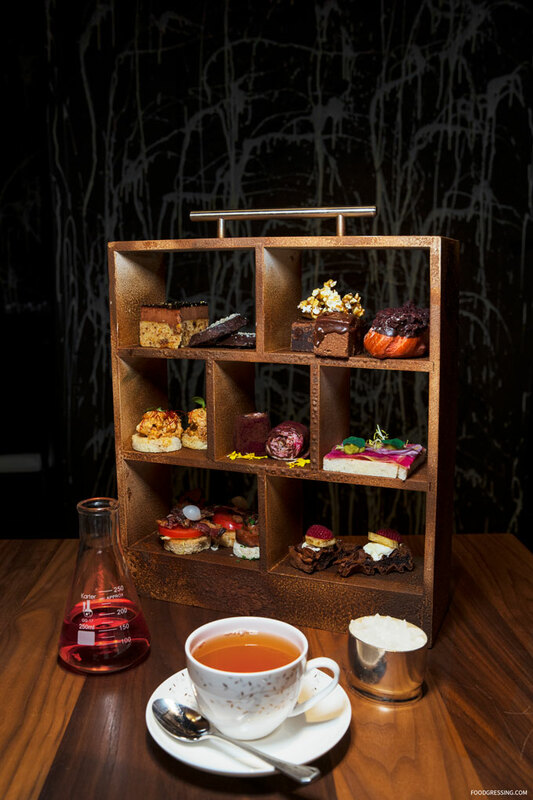 The Chocolate Laboratory Afternoon Tea runs until April 28th with sittings from Thursday – Sunday while on Fridays and Saturdays the Lounge offers a selection of laboratory-inspired cocktails. I was invited to a media tasting. Here’s a look at what you can expect. 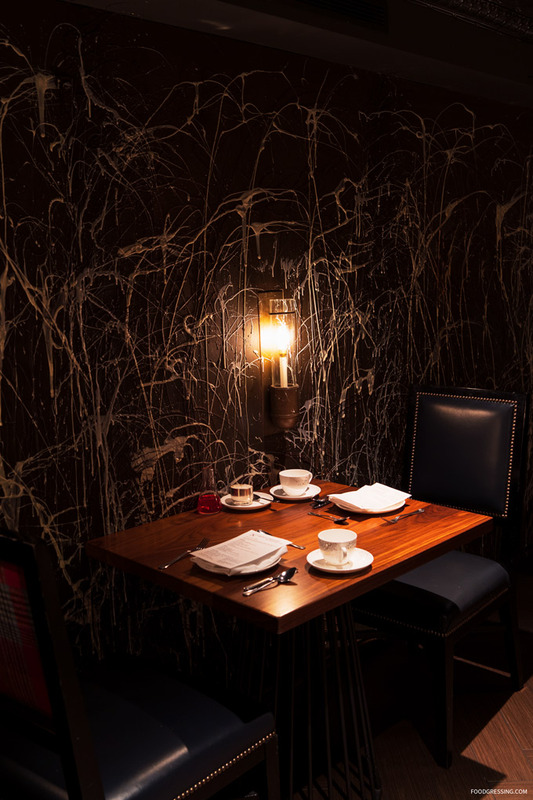 It’s a feast for the eyes for guests upon entering the private dining room of Notch8 as the room features custom built floor-to-ceiling chocolate-covered walls. 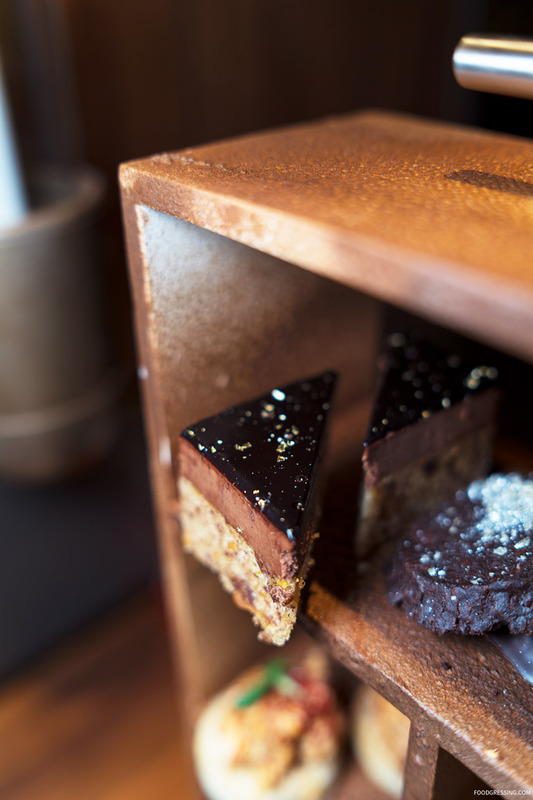 Priced at $59 per adult and $29.50 children 12 and under, the Notch8 Chocolate Laboratory Afternoon Tea features various chocolate-inspired sweet and savoury items. 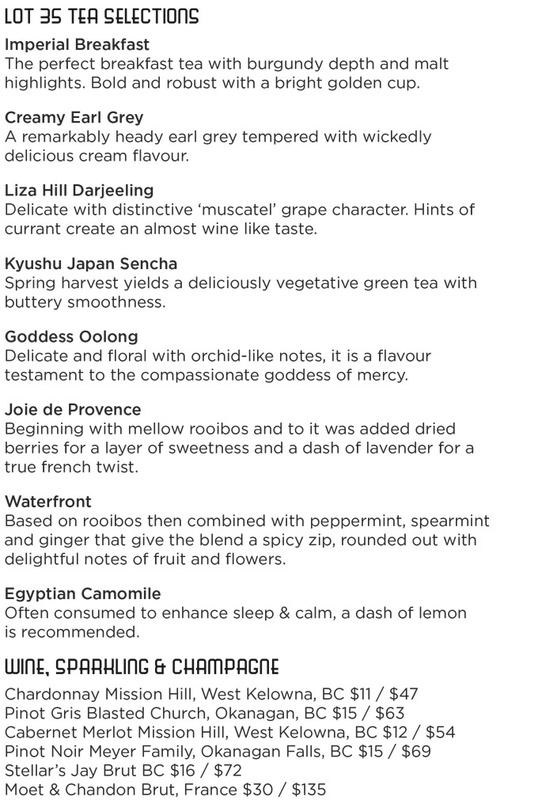 Guests begin by selecting their preferred choice of Fairmont’s LOT 35 Tea to sip on. I went with the Creamy Earl Grey with a delicious cream flavour while my guest had the Joie de Provence, a rooibos with dried berries a dash of lavender. 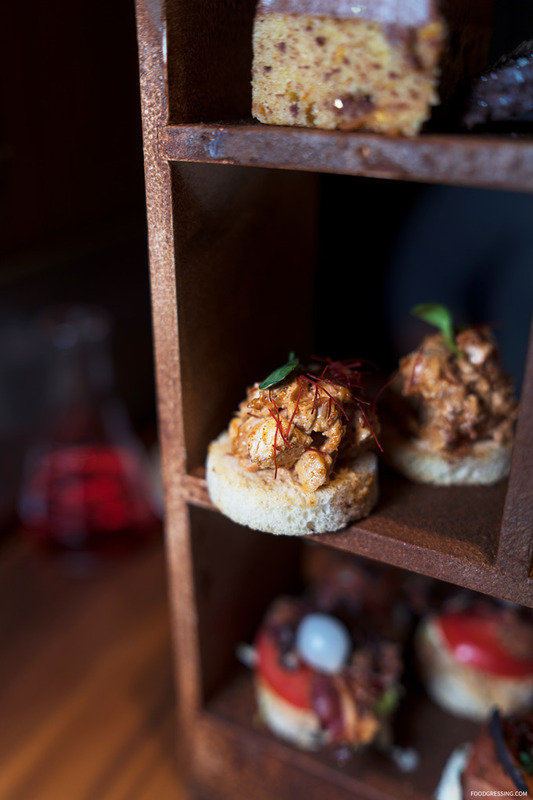 Anyone looking to add a tipsy twist to their Afternoon Tea can select from themed cocktails like The Oscillating Clock, made with Empress 1908 Gin, simple syrup, lemon and tonic. 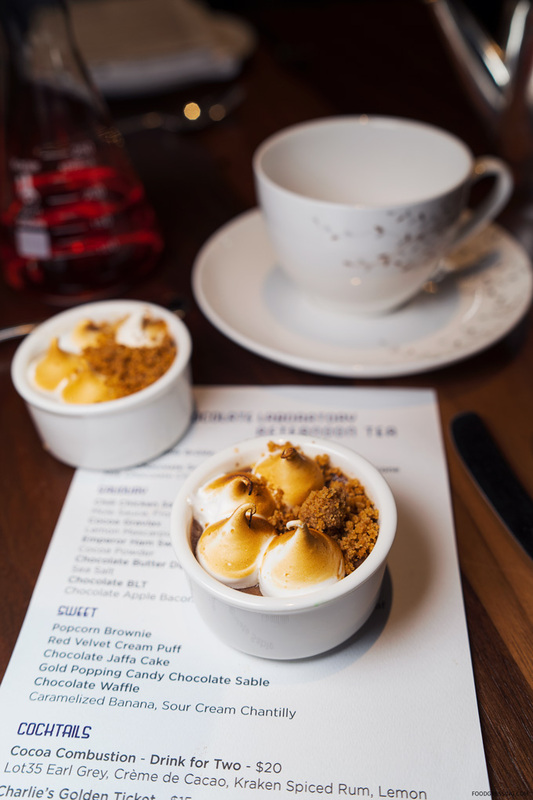 To start, we enjoyed a s’mores crème brûlée as a delicious palate cleanser. 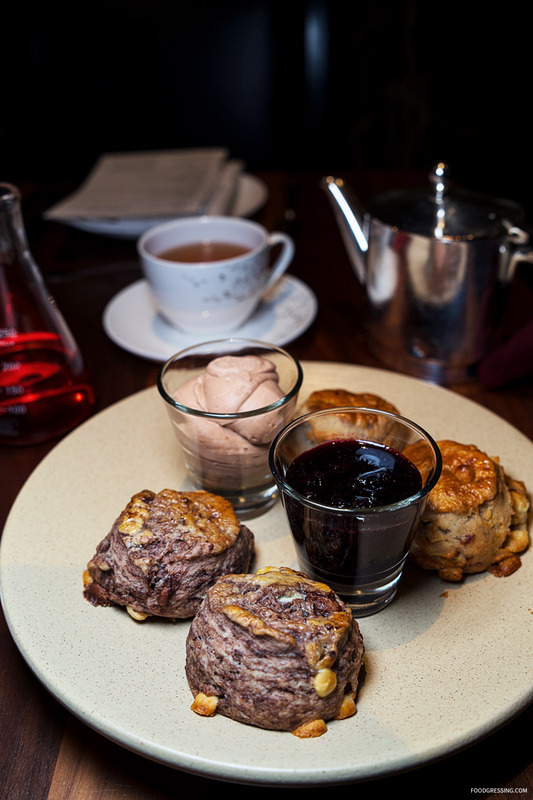 Next, we indulged in warm triple chocolate and raspberry white chocolate scones served with milk chocolate clotted cream and mixed berry compote. These scones were delicious to the last bite being wonderfully buttery, flaky. 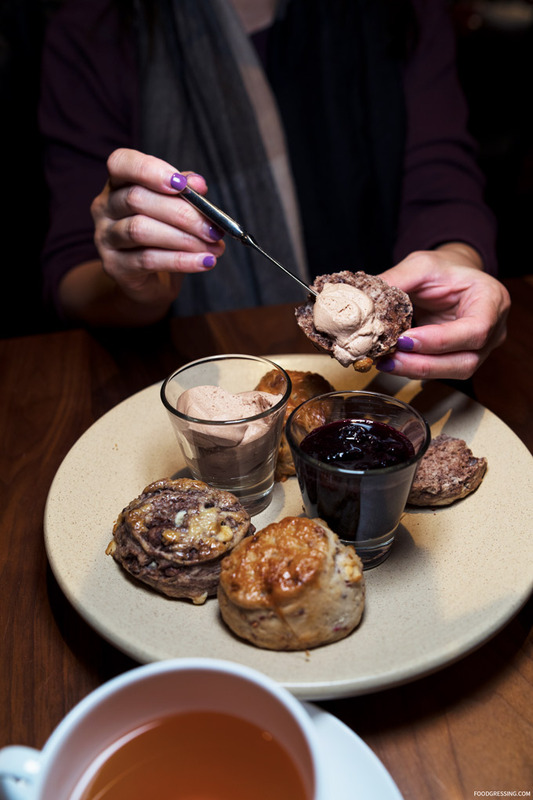 I loved the triple chocolate scones with milk chocolate clotted cream. 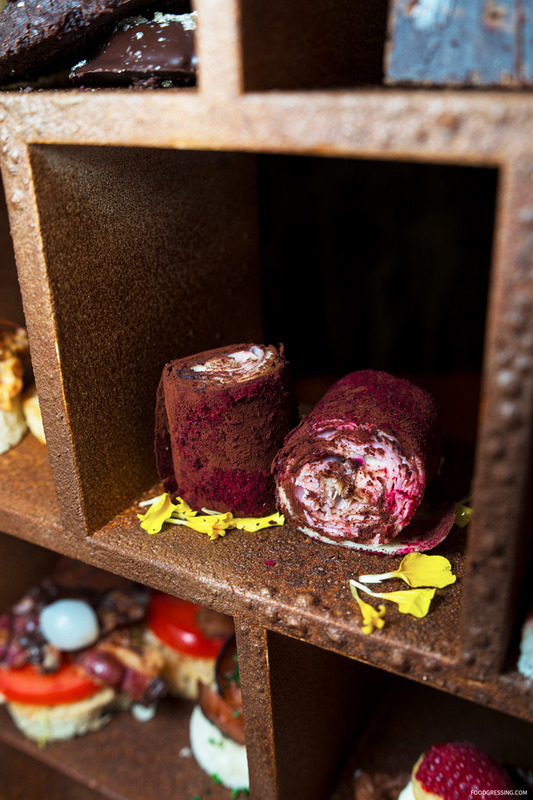 We were then presented with a three-tier display box containing the sweet and savoury items. The display box itself is dusted with chocolate so I found myself needing to lick my fingers after handling the box! The savouries include a Chili Chicken Sandwich with mole sauce and fromage frais; a Chocolate BLT made with chocolate apple bacon, tomato and iceberg lettuce; Emperor Ham and Swiss Crepe with cocoa powder; Cocoa Gravlax with lemon mascarpone and chives; and Chocolate Butter Dipped Red Radish with sea salt. 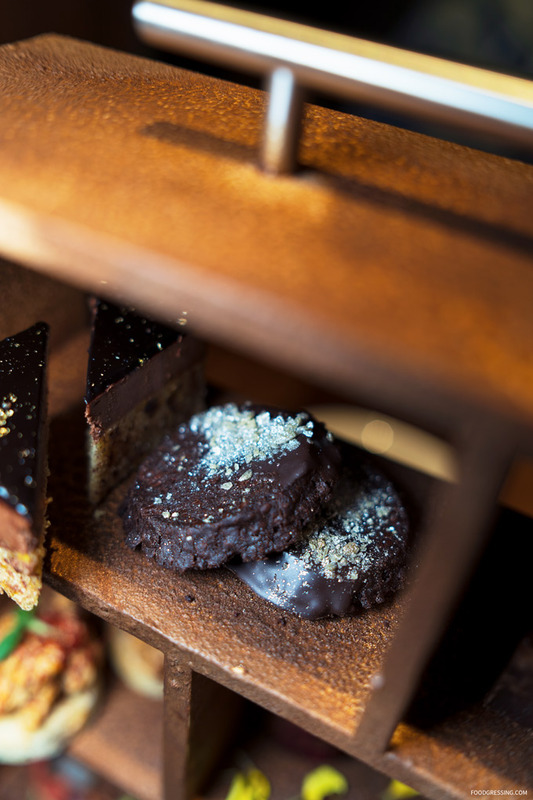 Sweet treats from the in-house Pastry Shop complete the tier with Chocolate Jaffa Cake, Gold Popping Candy Chocolate Sable, a Red Velvet Cream Puff, a Popcorn Brownie, and a Chocolate Waffle topped with caramelized banana and sour cream Chantilly. 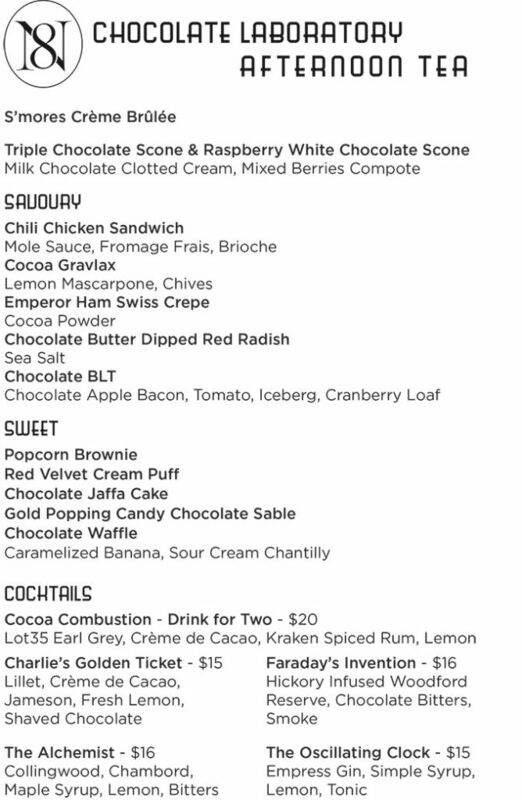 The Chocolate Laboratory Dessert Lounge, open on Friday and Saturday evenings, will offer a selection of cocktails, like the Cocoa Combustion, a drink for two that features LOT 35 Earl Grey Tea, Crème de Cacao, Kraken Spiced Rum and lemon. 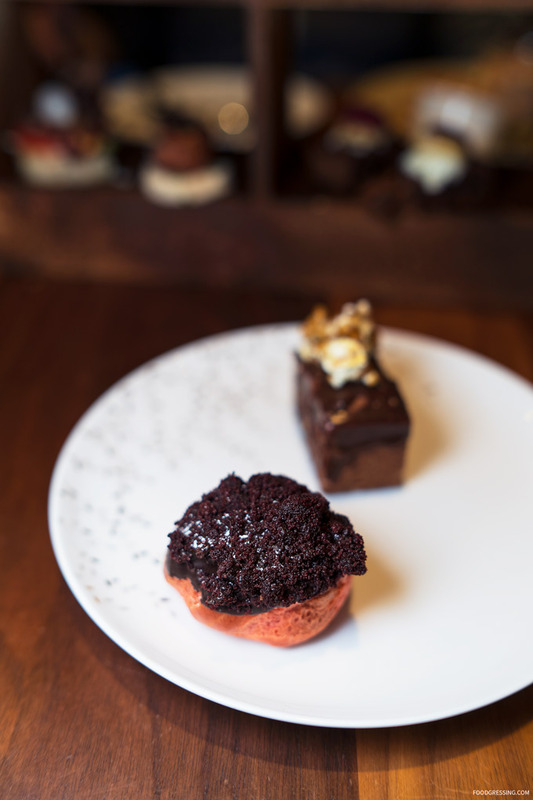 Dessert offerings include Liquid Matter made up of a dark chocolate cake, peanut brittle chunks, chocolate meringue, peanut butter ice cream and molten chocolate, or the Truffle Specimens that come in flavours like goat cheese and lime or olive oil and chipotle. 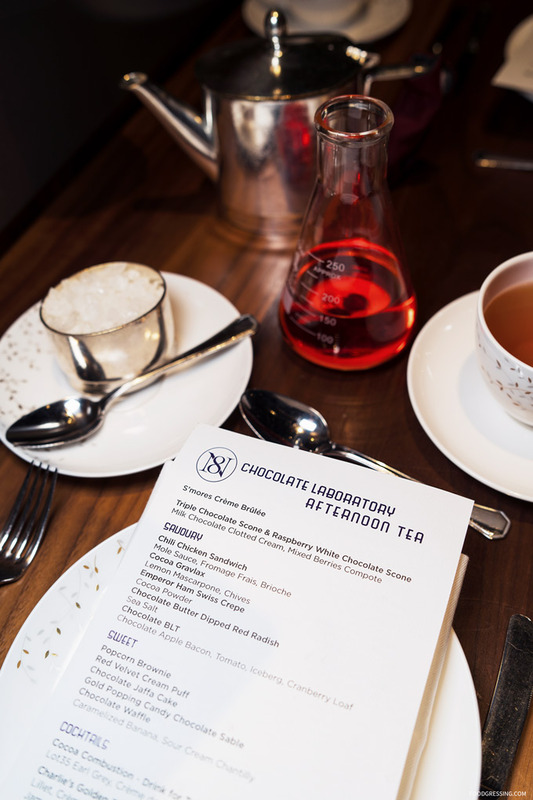 Chocolate Laboratory Afternoon Tea runs from February 28th – April 28th, 2019, with sittings Thursdays – Sundays at 11am, 1pm & 3pm. Adults $59, Children $29.5 (ages 12& under). 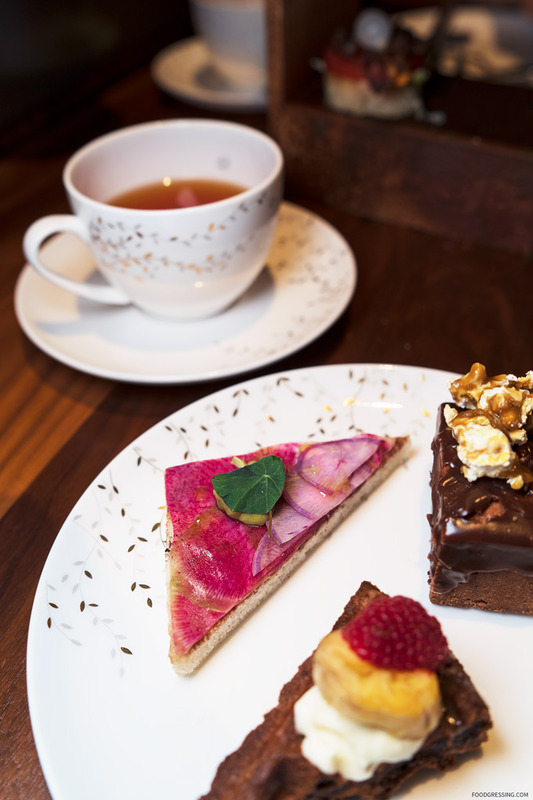 For tiny tots, a Children’s Tea is offered with kid-friendly tea sandwiches, scones, and other delicious sweets. 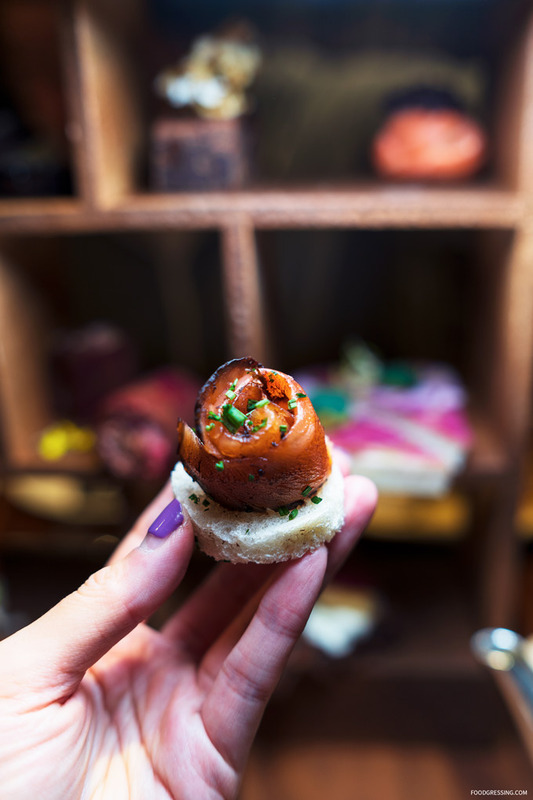 Additionally, options catering to guests with specific diet-dependent conditions such as gluten-free, as well as dietary preferences like vegetarian and vegan diets are available with advance notice at time of booking. 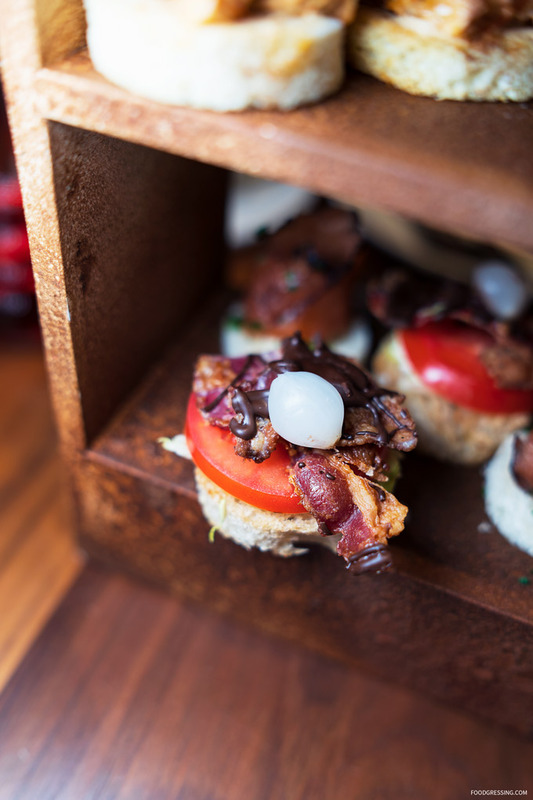 Reservations are strongly encouraged and can be made by calling 604-662-1900, or online through http://www.fairmont.com/hotel-vancouver/dining/afternoon-tea/ or http://www.notch8-dining.com/afternoon-tea/. 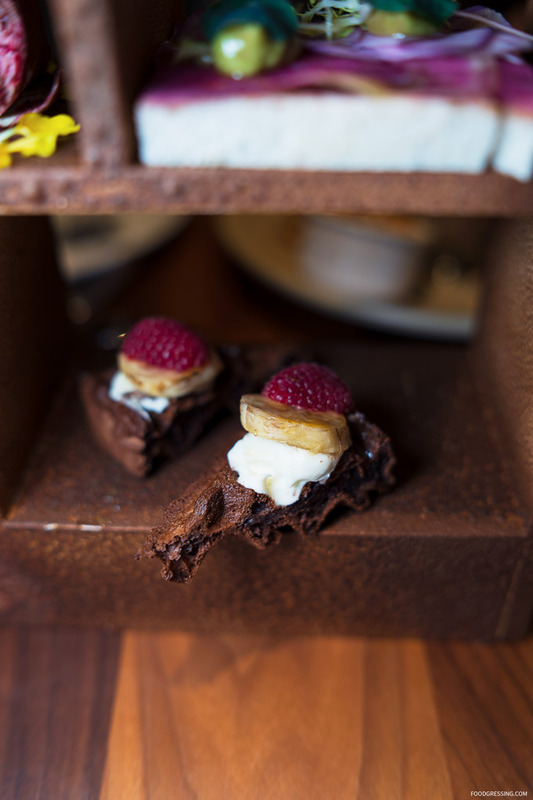 For the past three years, Notch8 has offered themed afternoon teas with a playful twist on the classic tradition. Changing quarterly, past themes include Mad Hatter’s Tea Party, Old World Carnival, and Enchanted Forest. Be sure to check back regularly on their latest offering.